The grieving period is different for everyone. Many of us feel awkward talking about death and shy away from talking to family and friends. It’s important to remember that communication is vital to helping you move on during the grieving period. Julia Samuel, author of GRIEF WORKS, shares how family and friends can help a grieving loved one. Be honest. Honesty is comforting and easy to deal with. There is a direct cleanness to honesty that cuts through much of the complex messiness of grief, and this can come as an enormous relief to people. Also be honest about what you actually can do rather than covering up because you feel guilty about what you can’t. Be specific: say “I’m going to come by for half an hour” or “I’ll come on Tuesday”; don’t say “I’ll come whenever you want, tell me, and I’ll be there,” and then find you can’t deliver on that offer. While being honest is important, so is being sensitive. Promiscuous honesty is not a good idea. Jenny, whose son had died very suddenly and tragically, showed me an e-mail whose first line read: “I’ve been thinking of you. . . .” It then went on to outline in great detail, in the chirpiest tone possible, how all the woman’s children were thriving. Be aware of the bereaved person’s feelings when you talk about your own living parent, partner, or child, when it is that relation of your friend who has died. Or be aware of showing too openly that your life is trotting along happily, which can feel like rubbing their nose in your happiness. These are only a few of the ways friends and family can help a grieving loved one. 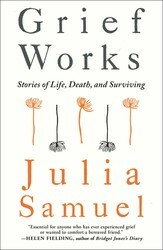 You can find all of the suggestions from Julia Samuel in her book GRIEF WORKS. Try coping with grief through art. Excerpted from Grief Works by Julia Samuel. Copyright © 2017 by Julia Samuel. Used by permission of the publisher. All rights reserved. An instant bestseller in the UK, Grief Works is a profoundly optimistic and compassionate handbook for anyone suffering a loss—from the expected death of a parent to the sudden death of a child or spouse—as well as a guide for those who want to help their grieving loved ones.Death affects us all. Yet it is still the last taboo in our society, and grief is still profoundly misunderstood. So many of us feel awkward and uncertain around death, and shy away from talking honestly with family and friends. Julia Samuel, a grief psychotherapist, has spent twenty-five years working with the bereaved and understanding the full repercussions of loss. In Grief Works Samuel shares case studies from those who have experienced great love and great loss—and survived. People need to understand that grief is a process that has to be worked through, and Samuel shows if we do the work, we can begin to heal. The stories here explain how grief unmasks our greatest fears, strips away our layers of protection, and reveals our innermost selves. Intimate, clear, warm, and helpful, Grief Works addresses the fear that surrounds death and grief and replaces it with confidence. Samuel is a caring and deeply experienced guide through the shadowy and mutable land of grief, and her book is as invaluable to those who are grieving as it is to those around them. She adroitly unpacks the psychological tangles of grief in a voice that is compassionate, grounded, real, and observant of those in mourning. Divided into case histories grouped by who has died—a partner, a parent, a sibling, a child, as well section dealing with terminal illness and suicide—Grief Works shows us how to live and learn from great loss.